The window display features a gold backdrop surrounded by a bold floral display of white and pink roses with elevated bell jars containing products from the collection. Inside the store, there is a huge curved panel with further Fifty Shades of Grey Official Pleasure Collection products with the headline “Explore your deepest desires ”. The collection also has its own section inside the store. Harmony has reported an increase in footfall ahead of Valentine’s and a spike in interest for the collection since the launch of the display two weeks ago. 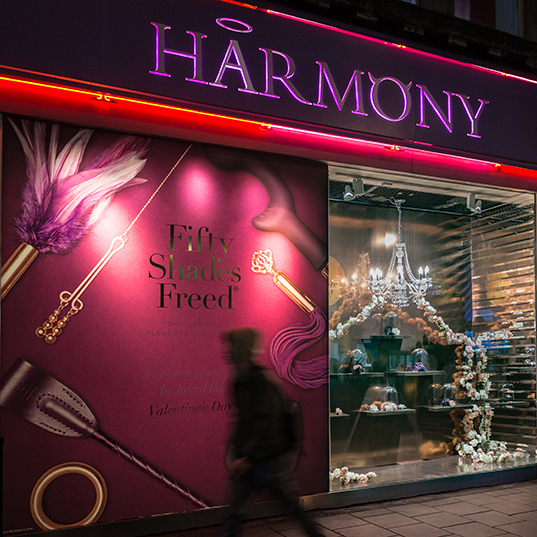 Jamie O’Sullivan, Area Retail Manager of Harmony Limited, said: “This fantastic window display which has created a real buzz with our customers as well as the Harmony team and increased footfall.